We were already fans of Apricorn’s keypad-sporting secure drives, especially the small Aegis Secure Key 3.0, which is only a little larger than your garden-variety USB thumbdrive. Now there’s the Aegis Secure Key 3z, which is the size of a standard thumbdrive—approximately 3.2 inches long, 0.75 inches wide, and 0.37 inches thick. Okay, a slightly long thumbdrive. Lacking the 3.0’s keypad cover, the 3z looks like a 1/8-scale garage-door opener when you pull it out of your pocket, but so what? Exposing the keypad lets everyone know they’re not going to get the data off your drive, so don’t bother. On the other hand, if you’re really trying to fly under the radar, just keep it in your pocket. The 3z is FIPS-140 Level 3 certified for security, is pending IPS57 certification (Q2 2017) for dust and water resistance, and is kind of fun to use. Formatted in FAT32 or exFAT, with the keypad obviating the need for lock/unlock software on the host device, you can use the Aegis Secure Key 3z on anything that recognizes USB mass storage. Computer, smartphone, Blu-ray player, industrial controller, car stereo, you name it; it should be able to read the unlocked 3z. Note that if you use only Windows PCs, formatting in NTFS, which is what we tested with, will give you better small-file write performance. The 3z’s keypad is tiny, but quite usable. Buttons require a firm press, but nothing that should concern any but the most fragile users. There are three status lights above the keypad to tell you whether the drive is locked (red), ready for programming or unlocking (blue), or unlocked (green). The lock and unlock function buttons reside below the keypad. To enable the drive and security, you press the unlock button plus 9, then enter a PIN, which must consist of seven nonrepeating numbers. Repeat the process and you’re good to go. The 3z has a small rechargeable battery on-board so you can unlock the drive prior to inserting it into the USB port. Even if you somehow let the battery die, don’t worry—you can unlock the drive while it's being powered and recharged by the USB port. Apricorn says the battery should last about six years under normal use. The unit is warrantied for three years including the battery. The 3z proved a decent performer for an external USB thumbdrive, if you keep in mind that all data is being encrypted to the 256-bit AES XTS standard. Don’t buy a super-secure drive if you want scintillating performance—that's not the point. AS SSD rated the drive as reading at 136MBps and writing at 28MBps. But that write number is the bare NAND performance as AS SSD issues the FUA (Force Unit Access) command before testing. CrystalDiskMark was more optimistic, and probably realistic, rating the 3z for writing at around 107MBps. Our real-world 20GB single-file write test took 4 minutes, 31 seconds, or 71MBps, splitting the difference. Writing 20GB worth of files and folders took 5 minutes, 41 seconds, or 59MBps. This comparison isn’t strictly fair, but it does show the relative performance against other USB options and the penalty AES 256-bit encryption imposes during writing. The 20GB read test took 1 minute, 53 seconds, or 176MBps, and the 20GB file-and-folder read test took 3 minutes flat, or 111MBps. It’s not the Samsung T3, but the 3z is far more secure and easily fast enough for its intended purpose. Unless your top-secret data is in the form of 2160p video, don’t sweat it. One thing about the Secure Key 3z, and many secure drives, is that it runs much warmer than a standard USB thumbdrive, as the encryption hardware uses a fair bit of juice. I experienced a strange, nearly hot sensation when I pulled the drive out of the port after writing a lot of data. The heat is not dangerous to the drive or your data as the brushed black-aluminum casing is the heat sink. With an option known as the Configurator, you might think that Apricorn contracts Arnold Schwarzenegger to come to your home and provision your Secure Key 3z. Sadly, that's not the case. But this10-port USB 3.0 hub and software ease the chore of handling accounts and PINs for a fleet of Secure Key 3z's. The software and surprisingly affordable USB Configurator hub allows IT departments to configure multiple Secure Keys at the same time. As you can see above, the ports on the Configurator are all on top in by far the most convenient location. The downstream port and power connector are on one end, and the whole deal is made of aluminum and is rather hefty. Despite that, it’s only $99, which kind of surprised us since corporate-focused hardware tends to be a bit pricey. For the security and cross-device compatibility it delivers, the Secure Key 3z is a bargain. It’s not cheap by other standards, mind you: $79 for the 8GB, $99 for the 16GB, $129 for the 32GB, and $159 for the 64GB. But that’s life in the secure-keypad lane. Obviously, the larger capacities offer a lower price-per-gigabyte ratio, but how much of your data really needs to be secured? While the 3z doesn’t really improve on its 3.0 predecessor's capabilities, the 3z is smaller, about half the weight, and appreciably cheaper—around $20 less for similar capacities. But the 3.0 is available in capacities up to 480GB as opposed to the 3z's maximum of 64GB. We say save some bucks with the 3z unless you need the larger capacities. If you’re worried about accidental key presses, don’t be. The buttons are far too stiff for any but the most forceful contact, and even if an accidental press occurs, the odds of seven correct presses in sequence are astronomical. Overall, it’s a nicely thought-out product. 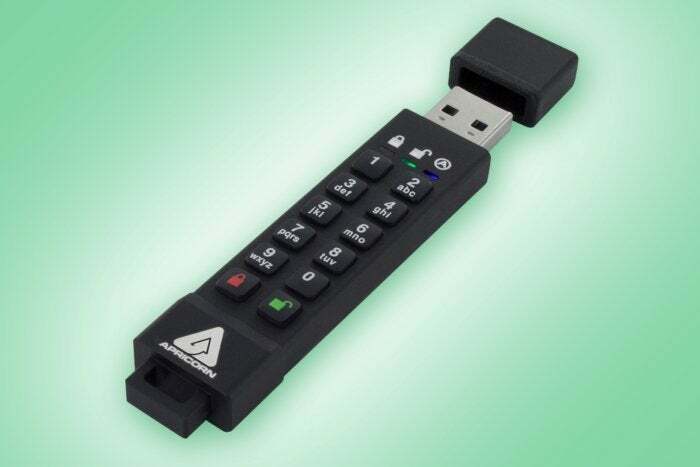 This small keypad-secure flash drive is FIPS 140-2 certified, and easy to use. It's also relatively affordable and can be configured en masse using Apricorn's 10-port USB Configurator for shops looking to roll out users and PINs for fleets of the devices.